Fabien wrote me im March 2014 that I should added the flag from Japan to Senpai on my link selection. So, I am thinking at this time that a pride programmer honors a pride country and Japanese people and his mentality. Wilhelm had an issue / theme for a wonderful new logo! Note: Information to Senpai will be collected here! After the Senpai FEOBOS analysis I have to test the new FEOBOS v20.1 Contempt 3 opening book. I will test the book with 40 moves in 40 minutes repeatedly tourneys with 22 participants. For sure with Senpai 2.0 BMI2 x64 as one of the 22 participants! 1 core on Intel Core i7-5930k / i7-4770k, 4.3Ghz, Windows 10 / 7 Prof., 4 rounds = 924 games! Test-1, 2926 Elo after 84 games. Test-2, 2916 Elo after 84 games. Test-3, 2952 Elo after 84 games. Statistics and games: feobos_v20.1_test-1-3_contempt-3.zip (4.633Mb). Significanthy lesser fast lost games for Senpai 2.0 if we compare with Senpai 1.0. Fabien solved the biggest criticism with his last changes. Great are the stats to the perfect running FEOBOS v20.1 opening book with "Contempt = 3". Senpai 2.0 BMI2 x64 will be analyzed now th 41.614 FEOBOS positions with 2 minutes per move and 4 cores. This need two months. 120 sec. per position,, 4.096 for hash tables, 4 cores / 4 threads (no HT), Intell Core i7-4770k, 4.0Ghz, Windows 7 Prof.
C) Senpai a B01 expert? Since days I try to win with my favorite Scandinavian line vs. Senpai. It's not possible for me. Vs. other engines I made some points here because I know the line and all the important variants. Playing the line since many years. Senpai is playing here very positional chess. Many possibilites for me as black player with moves like g6 or later b6 and strong bishops. Castling to the other site with attacking moves on white's king size, many chess programs have problems here. Black have many time to make the position from move to move better. Try it out vs. Senpai. Senpai is playing allways the right moves. ~ +85 Elo to the predecessor Senpai 1.0!! by Fabien Letouzey is available! It should be clear that Senpai 2.0 will be added as one of the 10 standard analyze engine for FEOBOS project. It's with Wasp an engine, available on my site and the FEOBOS book files should be optimised for Senpai. The Engine with the hightest draw score will be killed from the group of 10 FEOBOS standard engines (at the moment the famos Stockfish). I discussed with my FEOBOS partner / Excel programmer Klaus Wlotzka about it. Klaus have the same opinion. Senpai is strong in positional and strategic game. A playing style = must have for FEOBOS. We will do it end of January 2018. I checked in beta test phase of Senpai 2.0 the compatiblity for Shredder Classic GUI. Senpai 2.0 BMI2 x64 works fine (*.epd analysis) and is on start position on FEOBOS runway 21 and clear for take-off. 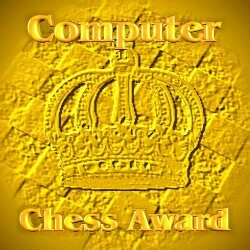 Listed below persons gave great helps for computer chess community and are computer chess experts. 1. Daniel José Queraltó, chess program Andscacs, windows compiles! 2. Michael (Mike) Byrne, variety of activities, mac compiles! Two flavors attached - macOS_popcnt and macOS_bmi2 . The bmi2 version was about 5% faster than the popcnt version on a bmi2 mac ( mostly recent macs). A pseudo bench on the iMac ( go depth 20) was about 1.430 Mnps, the popcnt version on a 2010 Mac Pro 0.990 Mnps. ... my symbolic long time Award for Gerd! I asked Wilhelm Hudetz for a new Senpai logo. Wilhelm started directly the work and sent wonderful logos. Fabien's art of chess programming should have a comparable logo with an artistic design. Fabien gave directly green light for the new logo versions!